Project Artwork is about fun, kid-friendly themes! Learning art should be fun! That's why I release a series of project lessons that follow a high-interest, kid friendly theme for each unit to get my students excited about making art! I firmly believe we BEST learn about the world around us by interacting with it! Art provides the PERFECT way to do this! All Project Artwork Club for Kids units are a series of at least four projects (and sometimes extra bonus projects too!) centered around an attention-grabbing topic or particular subject. The beauty of this is that the learning your children are doing is not separate or detached from other subjects but fully integrated with it! 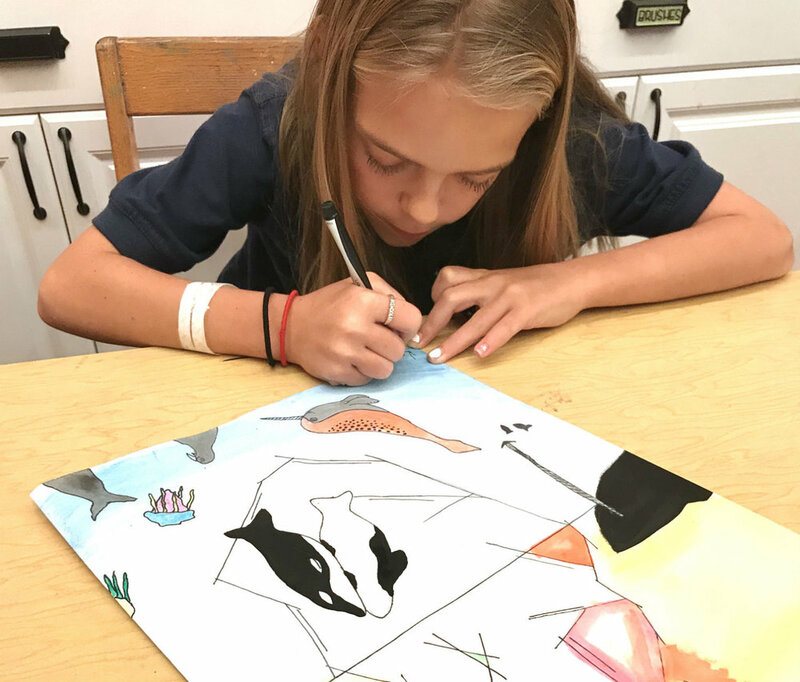 While Kendall works through the projects in the Arctic Wonders unit, she is not only learning foundational art skills, but also learning about geography, natural science, biology, anthropology, and art history! She will never forget the exact details of a narwhal, because she has spent hours analyzing, drawing, and coloring it. Her interest kindled from making a gadget-printed snowflake (which taught her about fractions and math vocabulary) may inspire her to read literature books about Snowflake Bentley. These integrated unit studies have long been something that, I feel, sets Project Artwork apart from other programs! My themed lesson series integrate easily with current subjects your children are exploring at home. They can also provide a launchpad for new ideas for your child to discover all while engaging in hands-on art-making! And I love the opportunity the units provide for a student to go deep with a subject--not just a quick 30-minute, "one and done" craft. These series are FULL length courses with multiple projects. If you are a homeschooler who loves to build your curriculum around literature, art, and outside exploration of curiosities then this is a perfect fit for you! Every Project Artwork series is a complete course which includes a variety of projects and instruction in several different mediums. You can check out which mediums we work with HERE.